There seems to be a delight amongst genre fans to see the world burn, through both films and novels. Into this milieu of misery comes a new trilogy, once again allowing us to watch the world burn. 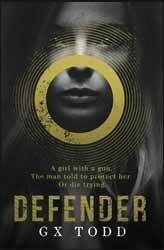 Defender (2017. 451 pages) is a post-apocalyptic novel, written by first time novelist G X Todd. We are not told how, but the people of the world started hearing voices, or at least the majority did, what followed was an epidemic of murder and suicide which decimates the world population, leaving it sparsely populated into which the good must contend with the strong. The PR blurb tries to associate the book with Stephen King's dark tone and there is some mileage to this, but the often extreme reaction to a world unmade, by some of the characters, has more in common with The Walking Dead, sans zombies. The story opens with the introduction of Pilgrim, the quiet, strong, type; he prefers to spend the end of the world by travelling across America alone, apart from the voice he hears in his head. We quickly learn that the voices were responsible for the mass killings and suicides, but not why. In fact the voice in Pilgrim's head may be overly sarcastic, but does not appear to present him with any harm. Luck and maybe good fortune has Pilgrim pass by Lacey’s home, who is selling lemonade in an odd attempt to connect with passers-by. Lacey has been hidden away by her gran to try and keep her safe, so has little first-hand knowledge of just how harsh the world has become. The only thing she knows is that she needs a ride to the city where she hopes to find her sister. Pilgrim, against his better judgement and that of his voice, agrees to help her. Along their journey they try unsuccessfully to rescue an unknown girl from her crashed car, a girl who is being sought by others. This simple act of kindness brings them into confrontation with a group intent on returning Rudy. Into this recognisable landscape of violent men praying on the weak, Todd has created an interesting conundrum. She has a further two book to go, so it’s not really a spoiler to say that Todd offers no definite answers as to where the voices come from or what, if anything, they are trying to achieve. We only meet Pilgrim's voice and it is not really forthcoming with answers. What we do learn is that it does not appear to mean any harm to Pilgrim, in fact it's positively helpful. Ultimately, the voice/voices are not just a novel plot devise but an integral part of the plot, with ‘voice’ having its own personality and possibly its own agenda. One of the things which impresses about the book is the characterisations. Pilgrim could have remained just the strong, silent type - a standard in many dystopian novels. Likewise Lacey could have remained the innocent in need of rescue, but through the novel both go on their own respective journey, ending the book as different people. There is a lot to like about the novel and I would certainly look forward to reading the next two books. A remarkable achievement, considering it’s Todd's first book.